Penny Kampe was born November 13, 1940 south of Stover, Missouri and departed this life on October 6, 2018 at her home in rural area of Cleveland, Missouri at the age of 77. She was the daughter of James and Maggie (Cox) Drury. Penny was a long time resident of rural Cleveland, Missouri. On December 2, 1955 she was united in marriage with Walter (Pete) Kampe and to this union 2 sons were born. Penny retired from Marion Merrell Dow during her tenure she developed a lot of friendships that lasted throughout her years of retirement. Penny liked gardening and working in her flowers beds while spending countless hours mowing, she loved to have family and friends over to enjoy her wonderful gift of cooking and baking. 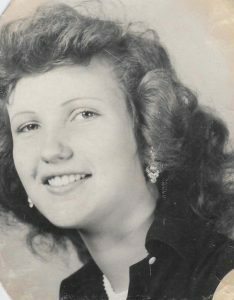 Penny was preceded in death by her husband Walter (Pete) Kampe Sr. after 49 years of marriage, also her parents, James and Maggie Drury along with 2 sisters Mary Barker and Peggy Simmons 4 brothers Boyd Drury, Charles Drury, Floyd Drury and James Drury Jr.
Penny is survived by her 2 sons John Kampe and wife Rachelle Steele of Independence Missouri and Walter and Karen Kampe of Olathe Kansas; three Grandchildren John, (twins) Chloe and Clarissa, 1 sister Linda Hayes, other relatives and friends. Cremation has been accorded. No services are scheduled. So sorry for your loss, Penny was a wonderful person and she will be missed. I wish words could heal the pain you’re feeling but take comfort in knowing she isn’t in pain anymore and is with the Lord. Thoughts and prayers for you and your family! We’re so sorry to hear of Penny’s passing. My dad sure did love her homemade pies. Our condolences to your family.